We hope your training is going well for the upcoming Cooper River Bridge Run 2019! One of the top Sports Podiatrist in our field has a really informative youtube video on common running injuries. It is about an hour video but we feel would be worth taking some time to listen to the video especially if you have been suffering from various running injuries of the lower extremity. If you are suffering from nagging foot or ankle ailments please give our offices a call so we can help complete your training and resolve your foot/ankle pain. Hope your traiing is going well for the upcoming Cooper River Bridge Run 2019. It is less than a month away! If you have been suffering from nagging lower extremity injuries from running and it is impacting your training please give our offices a call so we can diagnose and resolve your specfic injuries. 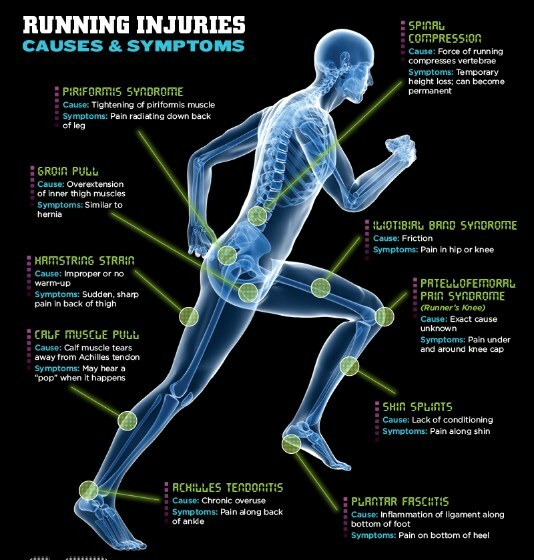 Check out this nice article on detecting the most common running injuries. We hope your Cooper River Bridge Run training is going well. We would like to talk briefly about a common running injury that we see in our practice which is the Morton's Neuroma. I have personally battled this condition on and off for many years. 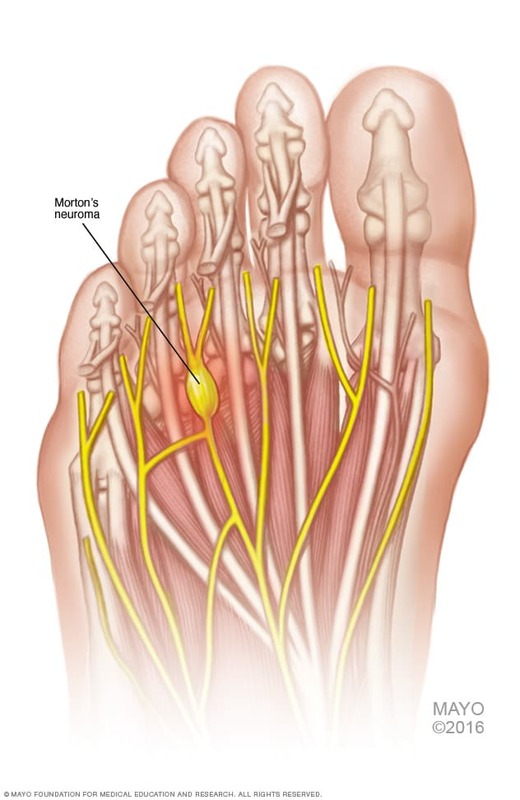 A neuroma is an inflammation of the digital nerve that runs between the third and fourth digits. Pain typically is sharp or throbbing and feels as if you have something bunched up in your sock. Radiating numbness and tingling can occur between the third and fourth digits. Contributing factors can be reduction of fat pad on the ball of the foot, increased load to the plantar forefoot, higher heel shoes, and tighter toe box shoes. Conservative treatment options would be wider toe box running shoes, oral NSAIDS, offloading metatarsal pads, cross training to decrease load on the plantar foot, cortisone injection, alcohol sclerosing agent injection, and custom foot orthotics. I would like to give you my personal insight considering that I have struggled with this foot condtion for the past 10 years. My neuroma pain has been managed with conservative treatment. I have custom foot orthotics with offloading metatarsal pad that takes pressure off the inflammed nerve, I have had two previous cortisone injections that have alleviated my pain. Recently I have changed running shoes. I have researched running shoes options and found that the Brooks ghost 11 has been the best running shoe for my neuroma. I feel that Brooks Ghost and Hoka running shoes would be good options if you are suffering from painful neuromas. As I increase my mileage I do sometimes feel the neuroma so I usually back off my mileage a bit and cross train. I suggest swimming, strength training, and cycyling. Other suggestions would be to run every other day to let the foot rest. Recently I have been running on the beach and I have found that the softer sand decreases ground reactive forces on my forefoot where the Neuroma is located. I have had patient's not respond to cortisone injections and other conservative options. If needed the alcohol sclerosing agent injection is another good option. This type of injection decreases the pain signal of the nerve that is inflammed. Good luck with your training and if you have any questions please email our practice or respond to the blog. The Cooper River Bridge run is just around the corner. Check out this nice article on basic running shoe anatomy.